I will definitely read again, very beautiful book, well written, with compassion and so much wisdom. Loved this book. Brene Brown is awesome. Absolutely IN love with this book. I have recommended it to many people that I knew would connect with it just as much as I have! 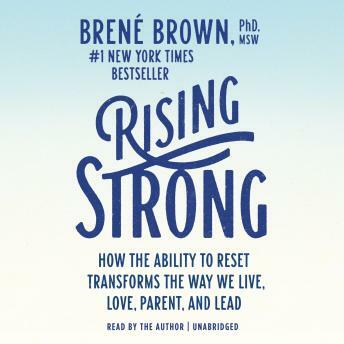 Cant wait to read/listen to more by Brene Brown! Amazing! I passed this book to my whole famliy and downloaded it on my Nook so I could take notes! Love that Brene' read it!! I loved this book. It teaches you how to examine why you feel things when you do, and how to masterfully cope with vulnerability in a positive way. If you are interested in challenging yourself to work into the next level of your life, I recommend this book. At first I thought this was going to be a waste. The author sounded like a "woe is me girl". That Changes, so give it time. This is a great book examplifying how all of us can better ourselves, our relationships, and our lives if we are willing to be loving, honest, open, and non judgmental in our relationships. Having the author as the reader really add to this wonderful book. I didn't quite get the point of this book. Found myself shaking my head many times while listening, or forcing myself to get through it. For me it was like a car wreck you just can't turn your head away from. I'm sure her philosophy resonates with a certain type of person, but it's not me... As a data scientist I kept waiting for her to support her views with real data but she never gave specifics of why her method is better than any others someone could make up. Being from Texas is not enough to accept her method as one I should follow, sorry. People are people and they come from many different backgrounds but we will always view life from the lens of our own experiences. That's not revolutionary. Amazing book, I know that I will listen to it over and over and I bought a hard copy to make notes! Thank you so much for your work and your insight, I hope I am forever changed!